Generally, I can be a pretty poor listener at times. I end up tuning out whatever someone is saying until key words are used. This was the case with Whipping Girl as she was yammering about her usual exploits. I did my best to give a few head nods and answer with generic phrases to give the impression I was interested. 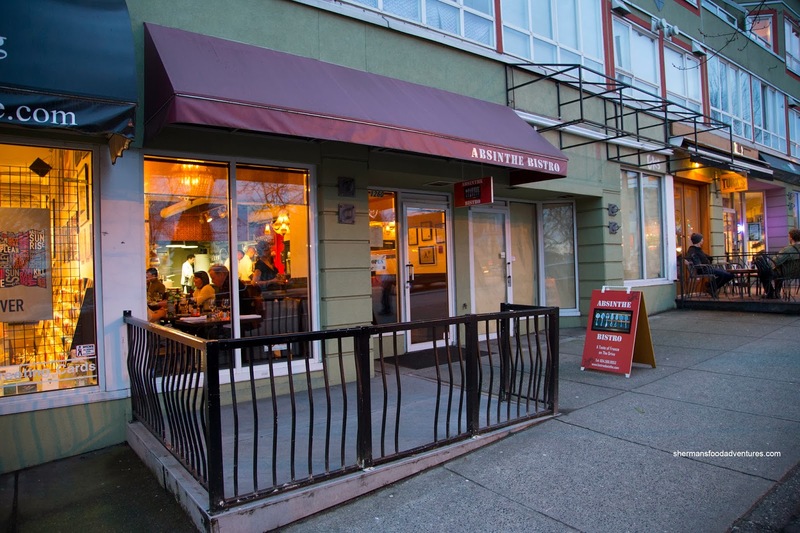 As I was just about to doze off, I heard "reasonably-priced French food" at Absinthe Bistro on Commercial. She was raving about the place (that I've been wanting to visit anyways) and kept bugging me to go. So I finally made a reservation for 4 including the likes of Darina and Ned Flanders. Everything about Absinthe is simple, from the basic yet warm dining space to the focused 9 item menu (3 appies, entrees, desserts each). 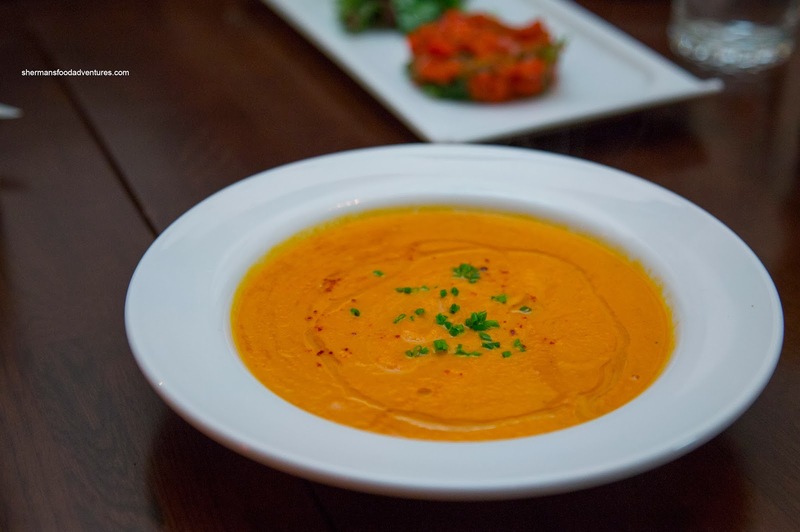 As such, we tried everything starting with my Creamy Carrot Cumin Soup. I've had many carrot soups, but they were able to elevate it where I wanted to lick the bowl. It was super smooth and creamy with lots of body. The cumin definitely announced itself, including a certain level of spice. 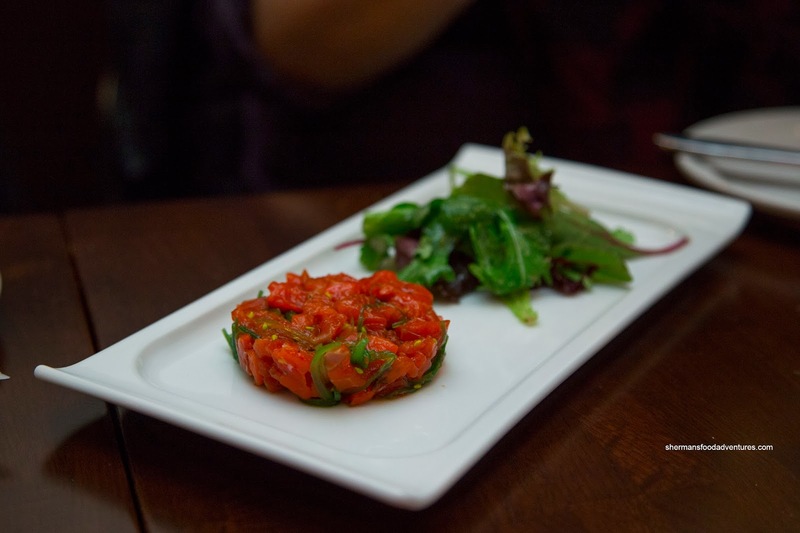 Next, Whipping Girl had the Salmon Tartare with Asian flavours and wakame. This came as advertised with a predominant sesame oil hit that was a natural accompaniment to the crunchy wakame and buttery soft salmon. I liked how the seasoning did not inhibit the natural sweetness of the fish. 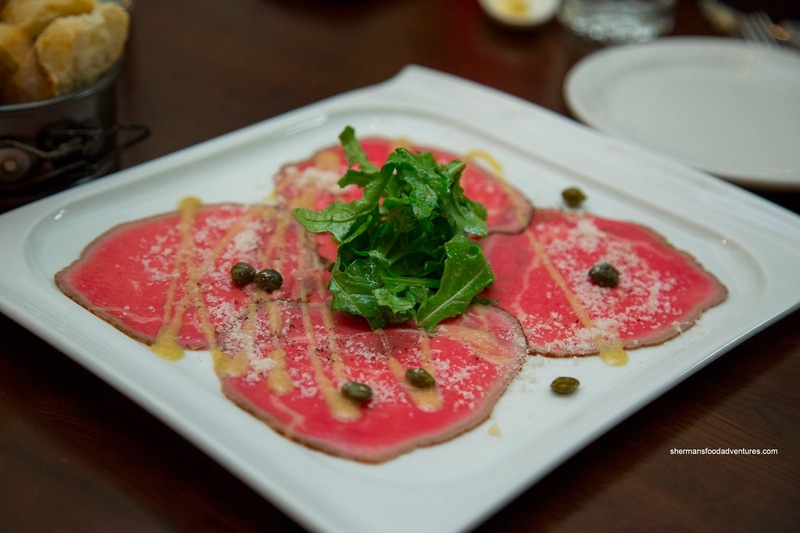 Both Darina and Ned Flanders had the Wagyu Beef Carpaccio dressed with mustard, capers and fleur de sel. Being rare Wagyu beef, it wasn't exactly super moist (fats were not activated from cooking), hence there was a slight chew. However, the flavours were purposeful and impactful. The saltiness combined with the mustard and natural beef flavour was fantastic. 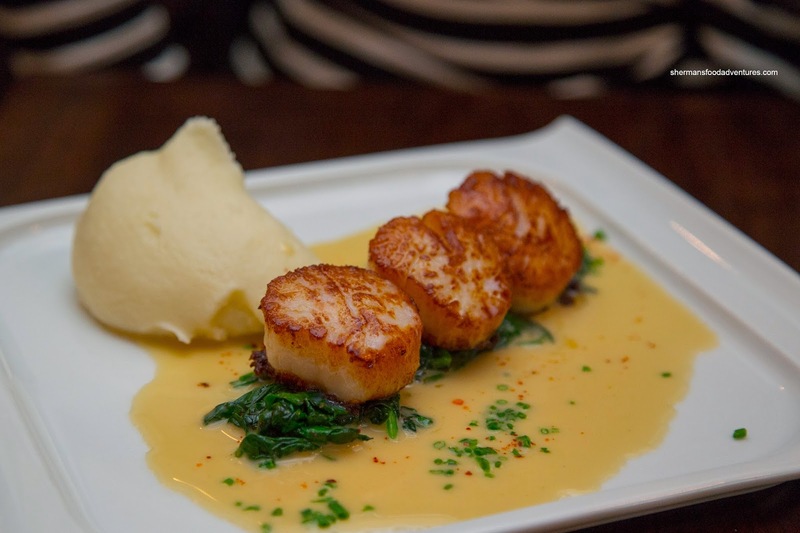 For her main, Darina had the Pan-Seared Scallops with sauteed spinach, beurre blanc sauce and potato puree. Seared a beautiful golden brown, the large scallops were barely done. Hence, they were buttery soft with nice caramelized flavours that accented the natural sweetness. The delicate beurre blanc did not interfere with star of the dish. Whipping Girl had the Coq of Vin which featured a chicken leg with mushrooms, carrots, potato puree and a beautiful demi. The chicken itself was sufficiently moist since it was the dark meat. 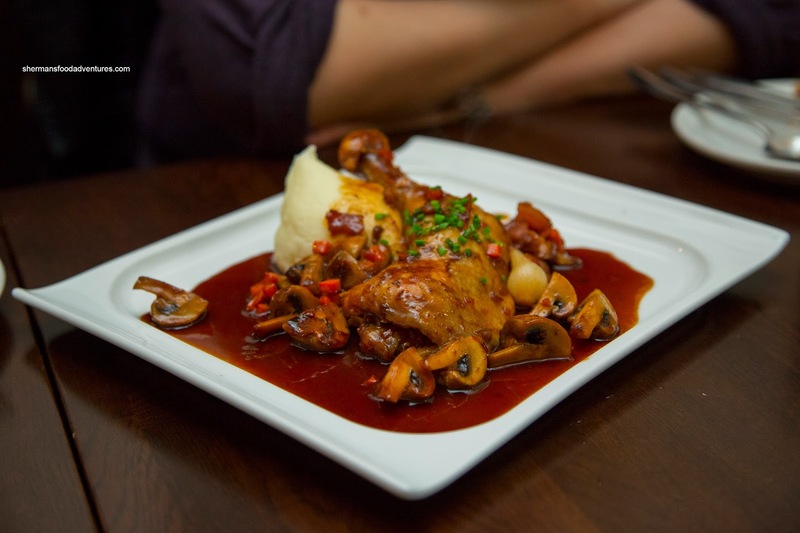 What really brought the dish together was the Earthiness of the mushrooms combined with the full-bodied demi. 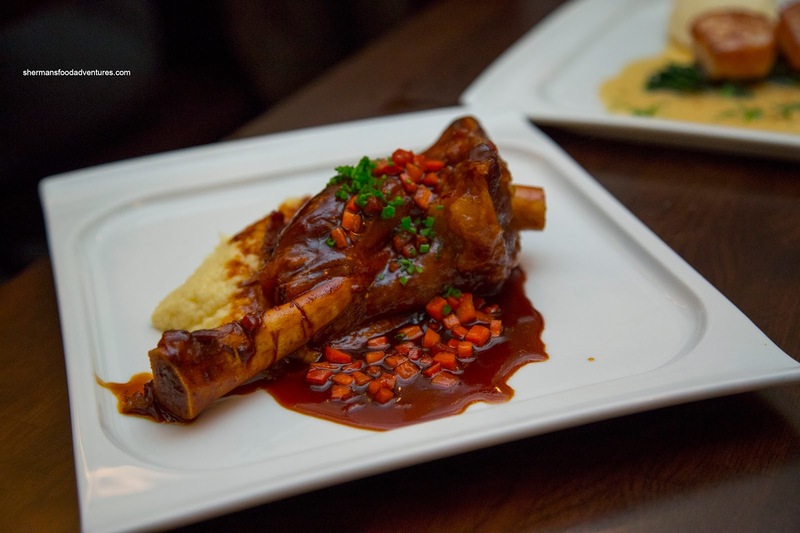 Ned Flanders and I decided on the Slow Braised Lamb Shank in a red wine tomato sauce with parsnip puree. Before we even got to the meat, the beautiful sauce won us over. It was tart without being too acidic and really showcased the red wine essence. It was super impactful where it didn't rely too heavily on salt. Naturally, this only helped make the sufficiently tender and gelatinous lamb taste even better. Of note, I enjoyed the Earthy parsnip puree on the side. 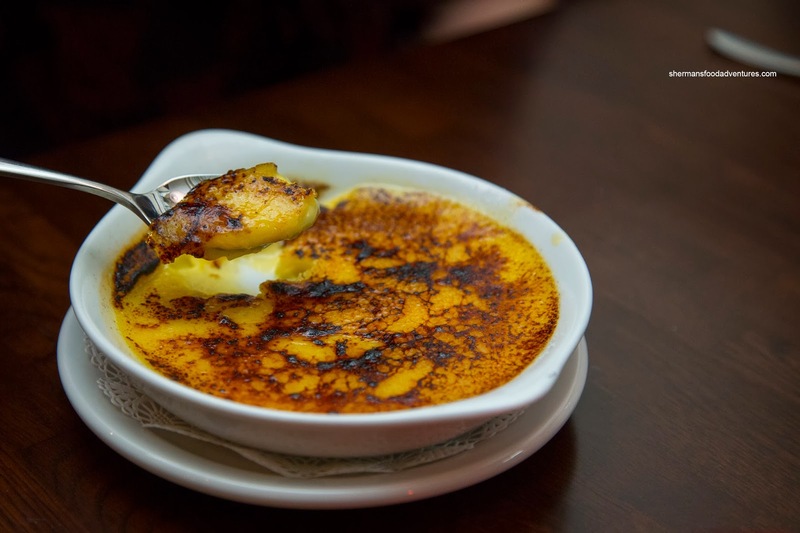 For dessert, we ended sharing 3 beginning with the Classic French Vanilla Creme Brulee. Although the burnt surface was not hard, it didn't detract from the strong flavours. The creamy custard livened our taste buds with fresh vanilla bean and caramel. 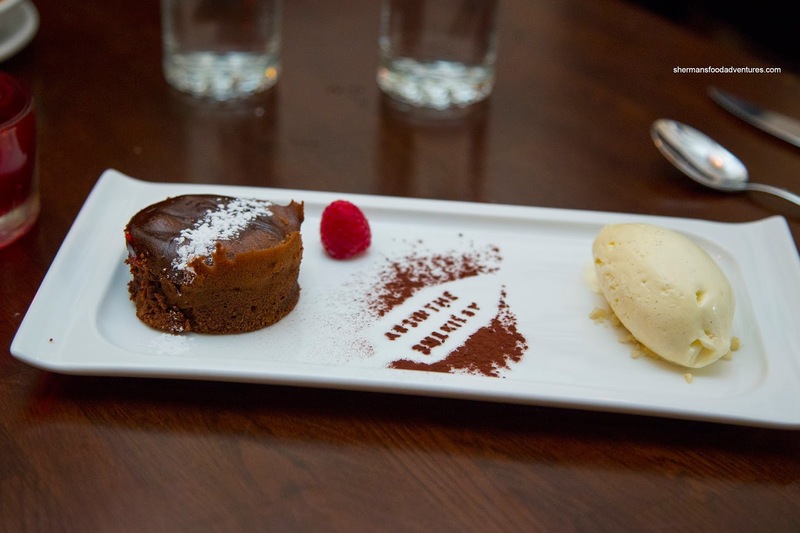 We all agreed that this was one of the more powerful versions of this dessert as each bite had impact. Next, I tried the Molten Chocolate Lava Cake with house-made vanilla bean Ice Cream. Another solid dessert as it featured a soft cake that revealed a semi-sweet molten core. The whole thing had a nice dark chocolate flavour without relying on much sugar. Moreover, the smooth ice cream didn't hurt things either. 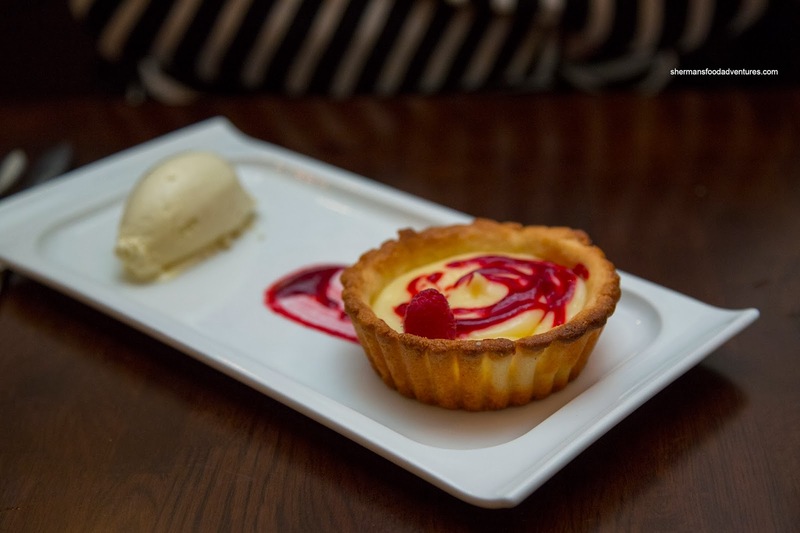 Lastly, we tried the Lemon Tart with house-made vanilla bean ice cream. We were not sure if they had baked the tart shell as long as they did on purpose or not. Whatever the case, it was extremely firm and nutty (due to the browning). I liked the crunchiness as it was a nice compliment to the smooth and creamy lemon custard. I found it not overly tangy while being just sweet enough. Okay, so Whipping Girl is right. I guess listening to her one in awhile might yield positive results. As for Absinthe, there is no doubt in my mind that it is a must-try in Vancouver if we take price, portion size and quality of food into account.